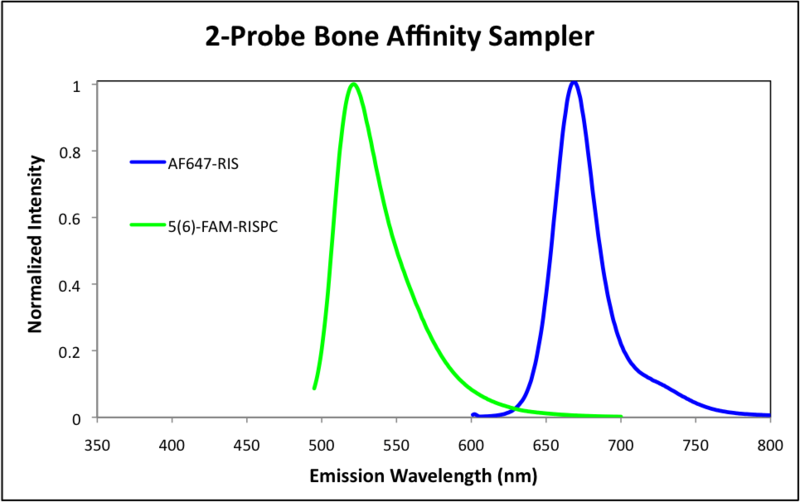 This sampler kit includes two imaging probes with different spectroscopic properties as well as variable bone affinities (AF647-RIS has stronger affinity than 5(6)-FAM-RISPC). The probes are fluorescent conjugates of risedronate, a widely used bisphosphonate drug in clinical applications, and its phosphonocarboxylate analogue. There is also an option of adding the calcein (a fluorescent molecule even lower bone affinity) in the kit. The kit can be used for simultaneous detection with co-dosing and studies on effects of bone affinity, and is a great, economical complement to the 3-probe bone affinity kit. This sampler kit includes two imaging probes with different spectroscopic properties as well as variable bone affinities (AF647-RIS has stronger affinity than 5(6)-FAM-RISPC). The probes are fluorescent conjugates of risedronate, a widely used bisphosphonate drug in clinical applications, and its phosphonocarboxylate analogue. There is also an option of adding the calcein (a fluorescent molecule with even lower bone affinity) in the kit. The kit can be used for simultaneous detection with co-dosing and studies on effects of bone affinity, and is a great, economical complement to the 3-probe bone affinity kit.